I had this conversation, again, just last week with a good friend. We were talking about being able to trust others after experiencing a breach in trust. Then I had it again with a friend who’s looking for a new business partner, and again with a friend who’s having a dilemma in his relationship. I realized it’s time to sum this one up and put it out there. It’s a funny thing the concept of trust. Or rather what’s really funny is how, over and over we are taught that everything lies outside of ourselves and slowly we keep coming back to the wisdom that it’s all within. It’s so common to hear “I’m not sure I can trust him”, “I’m looking for a trustworthy X” (X being a lover, a business partner, friend etc). We completely skip over the fact that we’re driving the bus, we’re making the choices, we’re calling the shots on who and how we interact with the world and people around us. We forget that we have this internal guidance, intuition for women, instinct for men that we’ve basically been socialized away from. Trust is an internal quality not external. It’s a non tangible quality, a feeling. When you trust yourself, you don’t have to worry about the other person being trustworthy, a situation being safe, a choice being right. You will know. If you feel someone is not trustworthy and you move forward with them in whatever endeavor, you are the one who is not being trustworthy to yourself. You already knew the choice wasn’t right for you at this point in time, so at the root of it, the issue is not the other person’s lack of trustworthiness, but really, that you didn’t trust yourself. 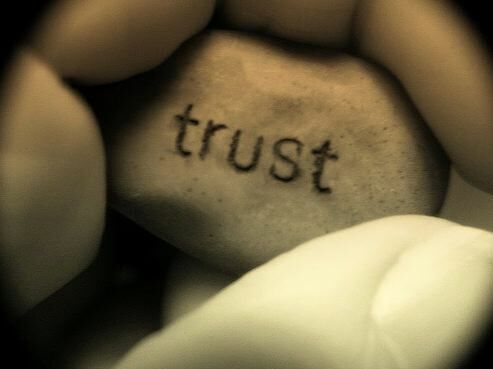 Trust being a nominalization (ah that lovely term again, the most famous one being the relationship nominalization), means it’s not something we can touch, or put in a wheelbarrow to carry around. And yet we keep referring to it as it was something to be acquired. It can’t be acquired because of it’s internal nature. It’s always there for you to draw on. It’s always available for you to act on. So how do you manage this essential non tangible element that is imperative to your ability to move forward? You do an internal check in and integrate that data in how you move forward. If someone feels like they can’t be trusted, great, but make it about you trusting yourself and not about them falling short. If a choice feels wrong (or better yet, right), focus on the internal wisdom, or hunch, that allowed for that conclusion. Bring your attention back to the trust you have in yourself. That’s the most powerful form of trust.